Eli Klein Gallery is pleased to present a solo exhibition of works by Zheng Guogu (b. 1970), an artist whose work responds to the rapid social and economic shifts in China brought on by globalization and mass media culture. This will be the first-ever survey of the historically significant Photoworks by the artist, whose treatment of photography has continued to be daring and inspirational. 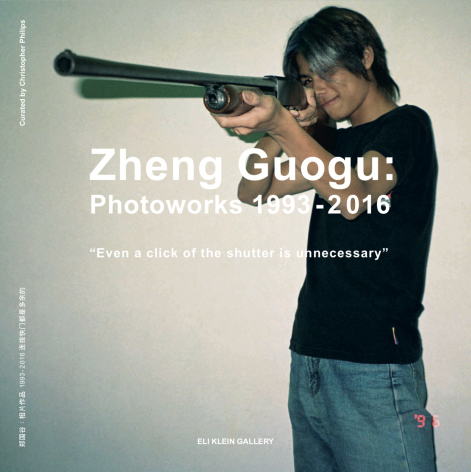 Curated by Christopher Phillips, a renowned curator and art critic specializing in photography, the exhibition will present a selection of Zheng Guogu’s Photoworks from 1993 to 2016 and will be on view from March 9 through May 18, 2019. The gallery’s exhibition will be on view concurrent with Zheng Guogu’s first solo museum exhibition in the U.S. at MoMA PS1. Zheng Guogu was born in Yangjiang, Guangdong Province, China. He grew up when the impact of the Cultural Revolution was waning as the country opened its door to an increasingly globalized world. As a result of this profound shift, Zheng Guogu had access to the cultures of the West and Hong Kong through television, pirated Hollywood films and computer games. This early exposure to Western media, culture and consumerism played a key role in shaping the artist’s worldview and artistic practice. During the 1990s, Zheng Guogu began to experiment with photography as his primary medium. One of his best-known works from this early period is My Teacher (1993). In this work, Zheng Guogu sits next to a homeless man close to his own age in the middle of the street as they both laugh full-heartedly. Zheng Guogu encountered this man while in Yangjiang and spent over six months observing his behavior, fascinated by his disregard for societal norms. Zheng Guogu continued to experiment with photography in works such as My Bride (1994) and Honeymoon (1995). In these works, he demonstrated that the camera can be used to capture a seemingly truthful image of an entirely fictitious event, similar to the ways in which images in mass media culture sell a false sense of reality. In 1996, Zheng Guogu created The Vagarious Life of Yangjiang Youth, which served as a crucial turning point in his career. Inspired by the growing popularity of East Asian gang films such as Young and Dangerous (1996), Zheng Guogu directed a group of teenagers to dress in the style of the characters in the film and to reenact the violence depicted in selected scenes. The resulting photo-series illustrates the power of mass media and its ability to influence the youth to cast off their own traditional cultural identity in favor of new attitudes and modes of behavior. A complete set of 16 prints from this series will be on display in the exhibition. The exhibition also includes Zheng Guogu’s later works from 1997 to the early 2000s in which he arranged extremely small images that are barely visible on a single sheet of paper. His best-known work from this period is Ten Thousand Customers (1997), conceived as an edition of 10,000 unique prints all dealing with the contemporary media environment. The mass-scale, double-exposed images reflect Zheng Guogu’s view of the overstimulation of Chinese mass media. On the one hand, the number of images contained in the photo-mosaic speaks to the overstimulation and mass scale of media consumption. At the same time, it also plays on the value of exclusivity in the art world. From the early 2000s to 2016, Zheng Guogu’s photographic practice continued to evolve, as seen in his Computer Controlled by Pig’s Brain series, which began in 1999 with paintings of text from mass media sources such as Yes!, a Hong Kong teen lifestyle magazine. The text-graphics were digitally altered and printed as rubber relief characters that were then stitched or adhered to the canvas. A digital catalog with an essay by Christopher Phillips accompanies this exhibition. Zheng Guogu was born in 1970 in Yangjiang, Guangdong province of China. He graduated from the printmaking department at the Guangzhou Academy of Fine Art in 1992. Zheng Guogu utilizes performance, photography, painting, sculpture, embroidery and the environment in his work. His ideas have often been born out of a balance between commitment to his hometown, engagement in global contemporary art, and his interest in how consumer culture has impacted Chinese traditions. In 2002, Zheng Guogu, Chen Zaiyan, and Sun Qinglin founded Yangjiang Group, an artist collective focusing on experimental Chinese calligraphy and sculpture. Zheng Guogu began a long-term project in 2004 titled The Age of Empire (after a popular computer game), later renamed Liao Garden in which he has reshaped and built upon land that he purchased near his hometown. The project observes the changing relationship of architecture and the physical land, in relation to the virtual, spiritual, and legal worlds. Zheng Guogu’s recent solo exhibitions include Zheng Guogu: Visionary Transformation, MoMA PS1, (2019); The Winding Path to Trueness, Mirrored Gardens, Vitamin Creative Space, Guangzhou, China (2017); Zheng Guogu: Where energy inhabits?, Galerie Chantal Crousel, Paris, France (2016); Zheng Guogu: Ubiquitous Plasma, OCAT Xi'an, China (2015); and Zheng Guogu & Yangjiang Group: The Writings of Today are a Promise for Tomorrow, Palazzo Morozini, Venice, Italy (2015). Zheng Guogu’s work has been featured in over one hundred institutional group exhibitions across the world. Recent shows include: Chinese Whispers: New Art from the Sigg Collection, MAK Vienna, Austria (2019); Art and China after 1989: Theater of the World, San Francisco Museum of Modern Art, USA (2019), Guggenheim Bilbao, Spain (2018), Guggenheim Museum, New York, USA (2018); The 9th Asia Pacific Triennial of Contemporary Art, The Queensland Gallery of Modern Art, Australia (2018); and Canton Express: Art of the Pearl River Delta, M+ Pavilion, Hong Kong, China (2017); and Unwritten Rules Cannot Be Broken (with Yangjiang Group), Guggenheim Museum, New York, USA (2016). Zheng Guogu’s work is included in important private and museum collections worldwide. He received the Best Artist Award by the Chinese Contemporary Art Awards in 2006 and currently lives and works in Yangjiang, China. 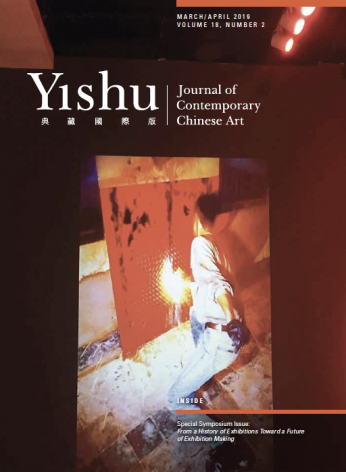 Zheng Guogu: Photoworks 1993-2016 "Even a click of the shutter is unnecessary"
Zheng Guogu's work is featured on the cover of the March/April edition of Yishu Journal of Contemporary Chinese Art and in Nikita Yingqian Cai's essay "Burn After Reading: The Transdualistic Resistance of Big Tail Elephants." Zheng Guogu is interviewed by Art Market Journal in regards to his upcoming solo exhibitions at both Eli Klein Gallery and MoMA PS1.